Douglas A-4C Skyhawk (BuNo. 147681) painted as it looked in 1965 when the aircraft was assigned to H&MS 15 on the USS Hornet. It was one of four A-4C aircraft assigned to the squadron. Tail marking YV, nose number 81. Tom Rancour wrote,"The fuselage of 147681 was found in a scrap yard in Michigan by Bob Schneider of Tyler, Texas in the 1990s. Bob traded HUMVEE parts for it. Bob was a USMC A4 pilot in Vietnam. He still flies an A4 for A4 LLC. I purchased the aircraft from him in March 2012. The wing is from a TA-4J and portion of the tail from a third A4. I have the tailpipe and an overhauled J65 engine in my building on display with my other military collection. The aircraft was assembled in Hawkins, Texas by mostly Vietnam A4 vets. I was able to get several photos of the aircraft in 1965-66 from the Skyhawk Association, Naval Aviation News and the 65-66 USS Hornet Cruise Book. I used the photos to make stenciling to recreate the insignia that was on the aircraft in 65 and 66. We painted it with Dupont Imron paint at $478/gallon so the finish would last. I was fortunate to have found and talked to the H&MS 15 Squadron controller and one of the pilots who flew the aircraft. It has been a great project to be involved in. I still have to add a border fence and an information plaque around the aircraft to dress it up. Maybe a navy yardarm with the appropriate flags also. I have met a lot of A4 veterans that stop to "say hello to an old friend". Douglas A4D-2N Skyhawk 147681 This plane entered service with the Navy on 2/25/60 based out of NAS Moffett Field, CA, with Attack Squadron 192 (VA-192). While there it served aboard the USS Bon Homme Richard for a couple tours, and then the squadron transferred to NAS Lemoore Field, CA in Jan 1962, and took sea duty with the Bon Homme Richard two more times until the plane was assigned to NAS Lemoore (with no squadron noted) on 3/25/65. In May 1965 it was assigned to MCAS El Toro, CA, with HQ & Maintenance Squadron 15 (HMS-15), and with Detachment N it deployed on the USS Hornet on 7/1/65 until 2/9/66 when it was assigned to NAS Atsugi, Japan. On 3/11/66 the plane transferred to NAS Cubi Point, Philippines. On 4/9/66, the plane went on board the USS Intrepid with VA-94 for combat over Vietnam. Later that month the squadron changed to the USS Hancock. On 5/2/67 the plane was back at NAS Atsugi until departing for NAS Cecil Field, FL, to join VA-34 on 10/3/67. 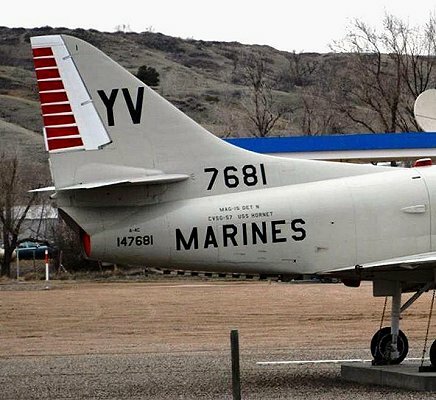 On 1/8/68 the plane was assigned to VA-66, also at Cecil, and deployed immediately on board the USS Intrepid for combat over Vietnam until ending deployment on 4/16/68. On 6/5/69 VA-66 again deployed to Vietnam, this time aboard USS Forrestal until August 26th when the plane transferred to VA-12 aboard the USS Shangri La for operating over Vietnam. On 3/18/70, while still fighting the war in South Vietnam, VA-12 transferred to USS Independence. On 1/20/71 the plane joined VA-305 at NAS Point Mugu, CA. On May 25, 1971 the plane was sent to the boneyard at Davis-Monthan AFB, AZ as 3A0337 until the Navy struck IT off strength in July 1974. 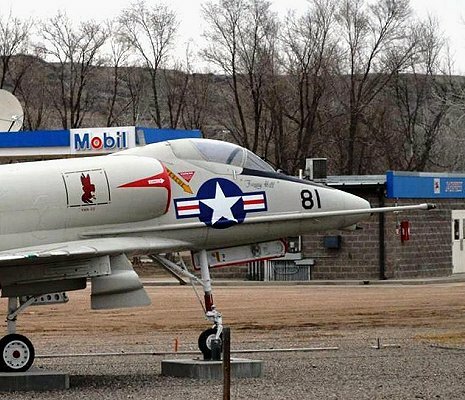 It was then salvaged at NAS Fallon, NV, where a pilot who had flown the plane in Vietnam found it dismantled a couple decades later. On Oct 23, 2012 he acquired it for his personal museum at Wasta, SD. Restoring it and marking it as it appeared during the Vietnam War while operating off of the USS Hancock.